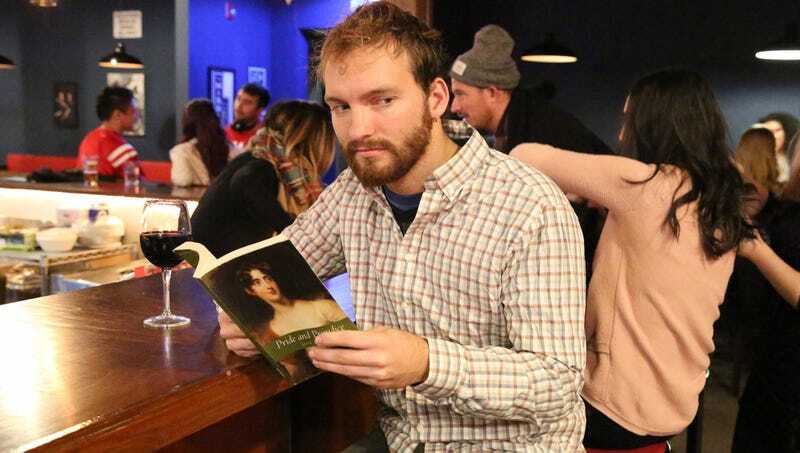 MODESTO, CA—Frustrated with the nonstop unwanted intrusions, local man Russell Goldin wished Thursday that the women in crowded O’Donnell’s Pub would let him read his Jane Austen novel in peace. “Jesus, will all these women just go away and let me enjoy Pride And Prejudice without being constantly interrupted,” said Goldin, explaining that just because he’s smiling and shaking his head as he reads the book in view of female bar patrons doesn’t mean he wants to be hit on. “Every single time I start becoming enraptured by an exquisitely rendered piece of British drollery, I’m pulled out of it by some lady trying to ask me what I’m reading. I came here to drink red wine and be transported to the world of the 18th-century British landed gentry, not make flirtatious small talk.” At press time, Goldin was forced to give a fake number to a woman who approached him asking if he would be interested in discussing Austen over dinner sometime.